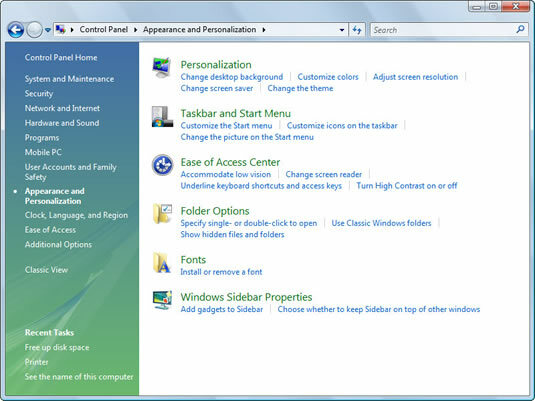 Choose Control Panel from the Start menu and choose the Appearance and Personalization category. The Appearance and Personalization area lists the main ways you can change Vista’s appearance. 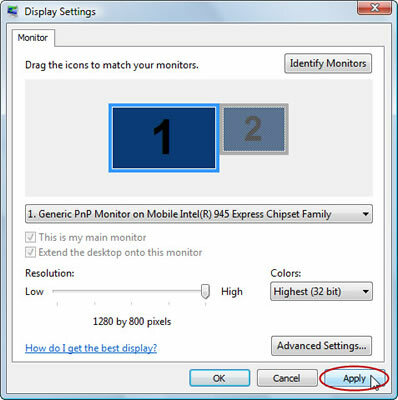 In the Personalization area, choose Adjust Screen Resolution. The Display Settings dialog box appears, as shown here. Change the number of colors your monitor displays, if desired. Vista lets you select several settings from the Colors drop-down menu. To change the screen resolution, use your mouse to drag the little bar in the Resolution area. Watch the little preview screen change as you move the mouse. The more you slide the bar to the right, the larger your monitor grows. Unfortunately, the more information Vista can pack onto your monitor, the smaller that information appears. View your changes by clicking the Apply button. When Windows Vista switches to a new resolution, it gives you 15 seconds to click a button approving the change. 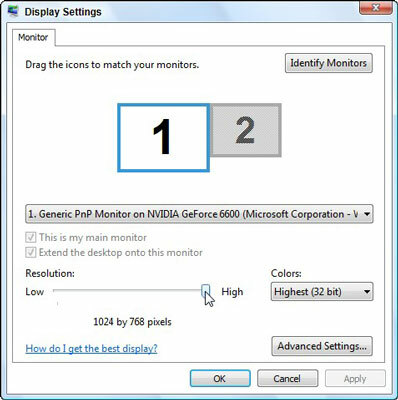 If the new resolution leaves your monitor blacked out, you won’t see the on-screen button. After a few seconds, Windows notices that you didn’t click the approval button and reverts to your original resolution. Click OK when you’re done tweaking the display. Your new screen resolution takes effect.